Former German striker, one of their best pre-War players. Josef played as centre forward and inside left. He was known for his great technique, stylish play and mobility. 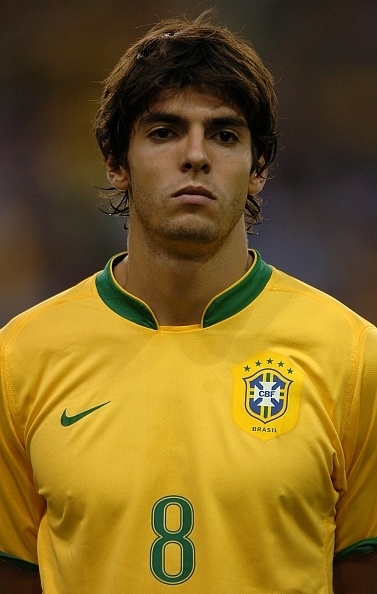 He was great scorer, two-footed player with great shooting, strong ground passes, elegance and solid heading abilities. Unfortunately he was a victim of opponents brutality which ended his promising career too early. Pöttinger celebrated its debut at 16 years in the first Team of FC Bayern Munich. His ball skills and mobility but not sufficiently protected him against the attacks of the body-hugging opposing defenders. From the beginning of his career, he had reason to struggle with injuries and also managed the breakthrough came at age 23 in season 1925/26. For winning the 1926 Southern German championship of Bayern Munich in Pöttinger contributed 57 goals. In southern Germany, he played on 28 March 1926 in the quarter-finals of the Cup campaign game against East Germany and on 18 April this year, he debuted in the national team. In the final battle of the 1926 Cup game on 4 July in Cologne, he scored three goals for the victorious 7-2 against West Germany Southern gates. A day earlier, on 3 July was the semifinal game against North Germany in Essen. "Sepp" contributed a goal in a 4-2 victory from South Germany. With his club Bayern Munich, he moved three times in the years 1926, 1928 and 1929 in the final round of matches in the German Football Championship. After winning the title again in 1928 in southern Germany reached Pöttinger and his playmates from FC Wacker Halle Bavaria and Cologne-Sülz the semifinals. There, the Hamburg SV put through but clearly against the Munich and Hertha Berlin also won the championship against sovereign. Pöttinger brought it to six games and six goals in the matches of the tournament. In southern Germany, he ran on in 1926 and 1927 in four games and hit four times in the gate. Many years of knee problems and a tibia fracture forced him early in 1931 to end his playing career. This happened to him as "Wiggerl" Hofmann and "Mile" Kutterer: The greatest triumph of FC Bayern Munich, they could no longer participate as active. The first two missions in the German national football team played Josef Pöttinger in 1926 to six links, as a connector between the club members' Wiggerl "Hofmann on left wing and the storm tank Otto Harder in the center forward position. From 1927, he replaced "Tull" Harder in the striker. After his debut with three goals on 18 April 1926 in Düsseldorf, 4-2 victory over the Netherlands was reported in the local sports press of a 'dream debut' of the novice cropping. With the Summer Olympics in Amsterdam in 1928 he was a member of the DFB-team in the two games against Switzerland and the Olympic champions Uruguay. 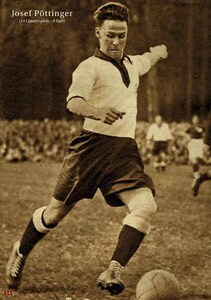 On 10 February 1929 he led the national team as captain in a 7-1 victory at home man against Switzerland. A 3-3 draw on 10 May 1930 in Berlin against England were the three Bayern striker Bergmaier, together with Ernst Hofmann and Pöttinger Kuzorra and three-time scorers Richard Hofmann of the assault team coach Otto Mink. With the 14th Use was the international career of playing center forward, who could put his teammates time and again in the limelight, to the end. Karl Hohmann, the man from VfL Benrath represented in the next few years of successful female storm the colors of the German national soccer team. After playing career was the first coach of the FC Teutonia Munich office of Joseph cropping. Then he took over VfB Pankow and then switched to the first SV Jena. In Jena he was able to celebrate in 1934/35 and 1935/36 the Championship in the middle before Gauliga Magdeburg, Halle and Erfurt. Coach later he still had at VfB Stuttgart (1939 -? 1941), FC Bayern Munich, FC Teutonia in turn, first FC Lichtenfels and from 1949 to 1951 and 1945/46 BC Augsburg. He died in 1970. 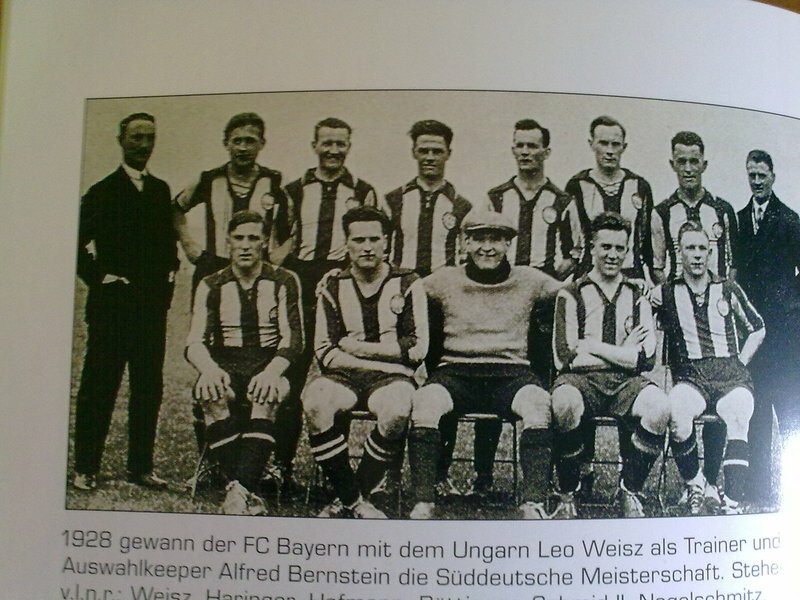 Here's a team photo from 1927-1928 Bayern team, maybe it's helpful for guessing his height and weight.. Looking at the pic, i'd say is the same or 1 cm more or less, and looking at the frame of him, it should around 68-72 kg..